I found this recipe on pinterest the other day, and it sounded too easy to pass up. Plus I have been craving lemon flavored desserts lately! Here is the recipe! His is yellow and mine is purple because I added some blueberries into the saucepan. I found that the lemony mixture never really got as thick as I thought it should, or like he describes. However, I also only added about 3 T of coconut oil into the saucepan while he says to add about 6. (I just didn’t want the extra calories or the greasy feeling that coconut oil seems to create in my paleo desserts) I am not sure if that would make a difference, but mine definitely did not look like his. Hi, Courtney. I’m Dinah, Ger Sasser’s mom. 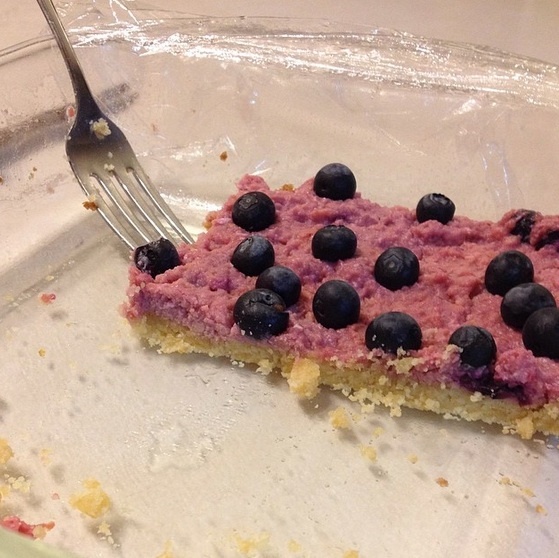 Our Paleo Lemon Blueberry Bars look great purple! I’ll have to try them that way. The mixture really does thicken all at once, just about the time you give up on it – lol! I’m so glad you shared Ger’s favorite paleo dessert!